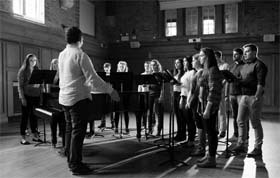 College Choral Series is a growing collection of imaginative and stimulating contemporary Irish choral music. Works by Irish composers are featured in this series, as are works by international composers based on Irish texts. We are proud to publish this series in association with The Choral Scholars of University College Dublin - Ireland's foremost collegiate choral ensemble - artistic director Desmond Earley. The series is due to expand over coming months with nine new pieces by Colin Mawby, Eoghan Desmond, Eoin Conway, Kevin Whyms, Desmond Earley, and Mark Armstrong.